Having cold feet is not pleasant and can lead to a drop in morale, so your challenge is to ensure they are warm enough for the conditions, and not too warm in summer. Using thin liner socks can improve your enjoyment of the day too. Firstly, the fabric wicks away sweat from the skin, like base layers for your feet; and secondly, any movement of your foot in the boot that could cause a blister should be ‘caught’ by the natural movement between inner and outer socks, thus reducing the likelihood of getting a blister. The traditional walking sock has evolved over the years and there is a wide range available. Choose a pair that of appropriate thickness/warmth for the prevailing conditions and ensuring that seams are flat to avoid rubbing, and blisters. Some outer socks have additional padding at the heel and ball of the foot, these being the places that take the most impact on a walk. Worth checking out such socks to see if they work for you. Socks don't last forever. Renew them periodically, as additional wear around the heel can be the cause of blisters, even though you may not notice the thinning of the fabric. 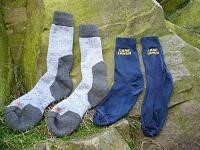 Whether to carry a spare pair of socks is a matter of personal choice, but are recommended if you're backpacking and wild camping. If you take a pair, stash them at the bottom of your rucksack in a waterproof bag etc.